The day after a massive snowstorm covered nearly two-thirds of the nation, the skies cleared over the Midwestern United States, revealing the impact of the storm. 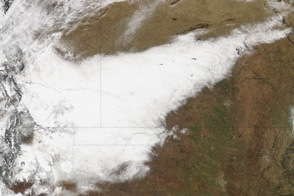 On February 2, 2011, snow covered the ground in a solid swath from eastern Arizona to the fringe of the storm in Indiana and Michigan. Eastern states were still swathed in clouds. 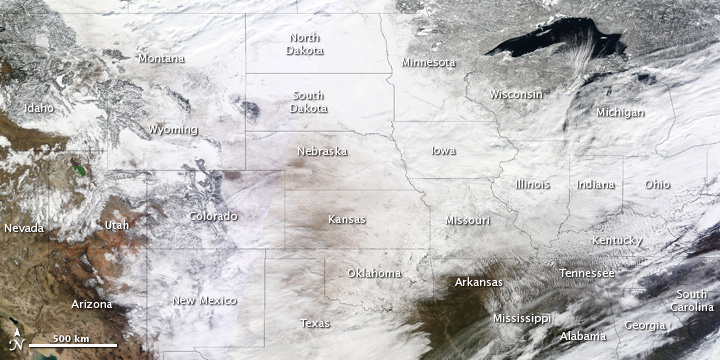 The Moderate Resolution Imaging Spectroradiometer (MODIS) on NASA’s Terra satellite took these composite images during three separate overpasses on February 2. The top image shows the United States in photo-like true color. The lower image was made with both visible light and infrared light to distinguish between clouds and snow. Snow is turquoise, while clouds are white and pale blue. The exception is a turquoise streak of icy clouds over Alabama, Georgia, and South Carolina. The storm that deposited the snow on February 1 tracked northeast from New Mexico to Maine. This means that the snow in the northwest (Utah, Idaho, Montana, and Wyoming) is probably not related to the storm. The giant storm left at least five inches of snow in 21 states and brought freezing rain and wind to more states. NASA images courtesy the MODIS Rapid Response Team at NASA GSFC. Caption by Holli Riebeek. Snow covers the ground in a solid swath from eastern Arizona to the edge of a massive winter storm in Indiana and Michigan in these images from February 2, 2011. 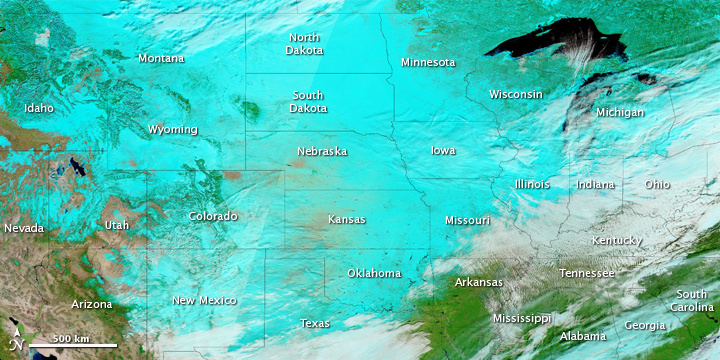 A massive winter storm battered two-thirds of the United States on February 1–2, 2011. National Weather Service. (2011, February 2). Historic winter storm. National Oceanic and Atmospheric Administration. Accessed February 2, 2011. The Hydrometeorological Prediction Center. (2011, February 2). Storm summary message. National Oceanic and Atmospheric Administration. Accessed February 2, 2011.